Thanks to NaNoWriMo, weddings, and now a fantastic cold, I’ve been a little bit slacking on the blog post front. But, hey, here’s some stuff I’ve been looking at lately! The Mary Sue had an interview with Adventure Time head of story Kent Osborne and voice of Flame Princess (King?) Jessica DiCicco. I’ve always wondered about the plotting of that show, how much they think out ahead of time etc…. turns out, it’s not too much. Even with big character reveals like the Ice King being Simon, that came from the actual boarding session, when they were finishing up the story for that specific episode. It’s kind of amazing to know that some richly complex story stuff can come from figuring it out as you go. 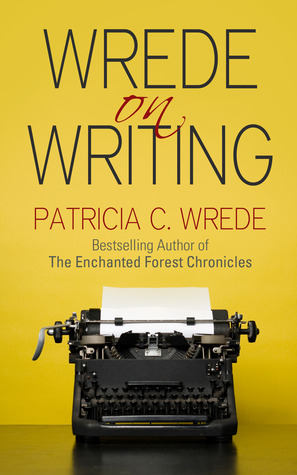 One of my favorite fantasy series that I read in adolescence was The Enchanted Forest Chronicles by Patricia C. Wrede. Well, Wrede finally wrote a craft book, and now that I’m in the mood for such things I snapped it up in the library. I’m only a very little way through the book, and right now it’s not quite one of my favorite craft books. But, one thing I really like is that she points out that all writers work in vastly different ways, so what might be good and helpful advice for one writer (always make a detailed plotline first!) could be utterly paralyzing for a writer that’s not suited to that kind of work. So, as she says, take every bit of writing must-does “with a boulder of salt.” Hmm. Maybe I am loving this craft book. Finally: have you all been watching Over the Garden Wall on Cartoon Network? The amazing cute-creepy-weird animated mini series by Adventure Time writer Patrick McHale? No? Oh my goodness, why not? Watch it, please. It’s so good. Not only does it look and sound beautiful, but it just refueled a love for dark fairy tale-like stories. So friends, what’s sparking your imagination this week?